The holiday season is full of hustle and bustle, and you want to make sure that you are prepared for everything that comes your way. While some families stay home for the holidays and play host to their friends and relatives, others may take a trip to visit their loved ones, leaving their homes empty. Before you pack up your suitcase and leave your home, it’s important that you take the necessary steps to ensure that your heating system won’t break or cause any problems while you’re away. One way to ensure that everything is functioning properly is to schedule an appointment with a professional. If you’re looking for expert HVAC contractors that you can trust in New Jersey, look no further than our expert HVAC company. Don’t wait until it’s too late. Contact us to book an appointment today. In the meantime, continue reading for a few tips to keep in mind before you leave for vacation this winter. 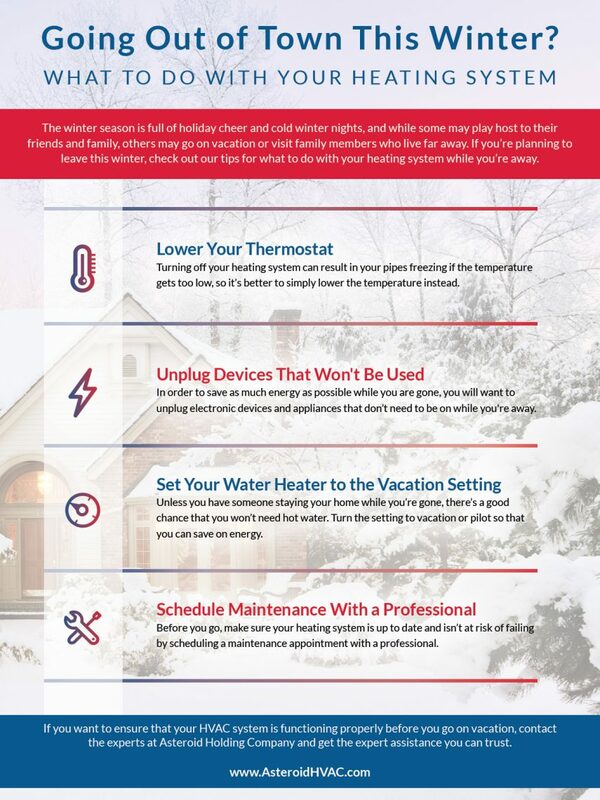 If you’re not going to be home for an extended period of time, your first thought may be to turn off your heating system completely. While you may think this will save you money, it could potentially lead to costly problems. Your heating system is what keeps the pipes in your home warm and functioning properly. If you turn off your heating system, your pipes run the risk of freezing and bursting if the temperature gets too low. Instead, when you leave for vacation, it’s highly recommended that you lower the thermostat to an acceptable temperature that won’t put your pipes at risk for freezing. Before you leave for your vacation, take the time to walk through your home and unplug any devices that won’t be used while you’re away. Electronics like your TV, coffee maker, and microwave use energy even if they aren’t in use, so it’s best to unplug them to save money on your electric bill. Try to unplug as many devices or appliances that you can to conserve energy, but don’t get overzealous and unplug devices that will need electricity while you are gone such as the refrigerator or lights that are connected to timers. Another way that you can save energy while you’re on vacation is to set your water heater to “vacation” or “pilot” mode. Unless you have someone staying in your home while you’re away, you most likely won’t need to heat your water. Setting your water heater on vacation mode or lowering the temperature will save energy that would otherwise be used to heat the water in your home without the worry of it freezing. If it’s been a number of months, or even years, since you last had someone inspect your heating system, it’s a good idea to have a professional take a look at it before you go on vacation. The last thing you want is to come home to burst pipes and a freezing cold home. Instead of hoping that your heating system will continue functioning properly while you’re away, contact the experts at for an inspection. Give yourself the peace of mind needed to enjoy your vacation, and schedule an appointment today!